I’ve been learning a lot about quinoa (pronounced “Keen-Wah”) and experimenting with some different recipes. Quinoa is not only delicious, it’s an amazing grain (actually technically it’s not a grain although it is very “grain-like”) because like soy it is a complete protein meaning it contains a balanced set of essential amino acids. Quinoa is perfect for those of us trying to cut back on our meat intake. I was inspired to create this recipe after being served a coconut and lime flavored white rice side dish at a local “fusion” restaurant (restaurant itself wasn’t worth mentioning). It tasted delicious, but white rice is boring and nutritionally devoid so I thought quinoa would be much better. I needed something to accompany my quinoa and decided that Thai Red Curry would be perfect because it typically contains coconut. The end result was really healthy and totally delicious! Next time I am going to try adding tamarind to the curry… stay tuned! Thoroughly rinse quinoa in a mesh strainer to prevent quinoa from being bitter. Bring the quinoa, coconut milk, and 1 cup water to a boil over medium low heat. Cook stirring occasionally until the quinoa has soaked up all the liquid. Meanwhile, bring the chicken broth and red curry paste to boil. Add the cauliflower and carrots and allow to simmer until the vegetable are tender, about 10 minutes. Using a slotted spoon remove the cauliflower and carrots and transfer to a large serving dish. Add the sugar snap peas and summer squash to the simmering broth and cook until tender, approx 5 minutes. Using the slotted spoon, transfer the sugar snap peas and and summer squash to the serving dish. Allow broth to reduce to 1/2 cup. Season with salt to taste. Pour over the vegetables. Once the quinoa is fully cooked remove from heat and mix in the lime zest and juice. 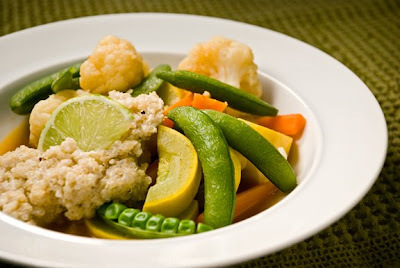 To serve, spoon the vegetables and broth into individual serving bowls and top with a scoop of the quinoa. Enjoy! This sounds delicious! It was very interested learning about quinoa too. I love this blog. Thanks Sue! I will have to bring in some quinoa next time I make it for you to try. I never thought of quinoa as a comfort food until I made this - thanks.